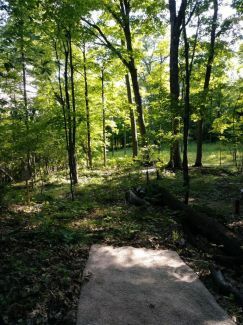 Description: Technical, wooded par 3 course on Mt. Zion ski area. Very hilly, and very wooded, save for holes 1 and 9. Two carpet tees on most holes, two pins on most holes, two wood benches and one large downed tree make a natural bench on two holes, and garbage buckets every three holes. This is the final redesign of the facility's course - the last design had too many open holes with incredibly fast growing and long grass that the ski area couldn't keep up with. Course will not be taken down (tees and baskets do not conflict with ski runs, except for 1, which has an alternate pin position in the woods - signs may be taken down), but it is technically still a seasonal course and will not be playable once ski season officially begins, or snow making operations and snowfall hinder play. Season usually lasts from late April/early March through early November. Local Directions: Half a mile north of US highway 2 in Ironwood, MI. Take Lake Road about half a mile north and make a left onto the GCC campus, or take Greenbush Street same length, make right onto Jackson Road, and left into parking lot - then follow parking lot towards the ski hill. First tee is to the rightof the chalet, and up the hill a tad.